Continual learning is key for career growth and leadership success! More important than any degree you will earn, more important than any certification or credential you will obtain, more important than how you dress and whether or not you have an executive presence, more important than developing all the great leadership competencies we have studied and teach, more important than a solid handshake, a first impression, and even more important than cultural fit, emotional intelligence and your IQ level is your ability, willingness and commitment to learn, unlearn, ask questions and learn some more. Don’t get me wrong – I advocate for intellectual learning, educational accomplishments, cultural fit, emotional intelligence, etc. Go ahead and get everything else. Tile your wall with degrees from the greatest schools, network with leaders in your industry, add credential after credential to your resume, and keep that running list of alphabets after your name. But here is the rift. If you do achieve all of this but neglect to add in the four key ingredients (learn, unlearn, ask questions and learn some more), you will – there is no maybe to it – fall short of your leadership potential and not achieve the kind of career success or respect you seek. Never stop learning. If we are not learning, we are not growing, and if we are not growing, we are indeed dying. I attribute my career success to several things, but at the top of the list would be my commitment to life-long learning. I do mean real learning using any and all available formats, forums, and methods (i.e., reading, debating, dialoguing, researching, studying, teaching, analyzing, networking, meditating, and thinking) as often as humanly possible. There is strength in learning and with continuing to challenge yourself and stretch your thinking, you experience meaningful results. There is an unbelievable power and confidence in knowing you are growing and taking in all the brilliance and greatness of other great thinkers on your journey. Finally, you show you have actually learned something when you apply the knowledge and information to what you do. Telling people what you have learned is sometimes helpful, but showing people what you have learned by making the necessary behavior changes is key. I have often heard managers describe their reasons for not hiring “overqualified” or highly experienced people being because they fear these candidates won’t be able to “unlearn” and open their minds to new thinking, ideas, approaches and methods. Hiring managers’ resistance to seasoned and older workers lies here, but I have also seen this become a problem for some younger workers as well. 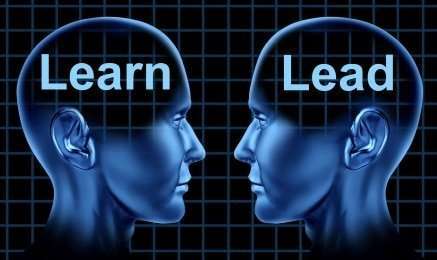 When you demonstrate your ability to think differently – to sincerely contemplate another’s perspective, experience, concepts and viewpoints – you are saying that “I am open to new learning.” Another point on “unlearning” is that sometimes we learned it wrong from the beginning (the method, concept, idea, etc. was flawed) and we have been spouting that same “flawed” thinking for years. All experience is not valuable experience. If I say I have 20 years of experience, you would hope that means that I have really learned all sorts of new, different and creative ways to do things or that I have learned how to think about things more deeply and learn from my mistakes. But this is all too often not the case. Many times, when someone claims 20 years experience that is really just one year of experience repeated 19 more times without any new learning taking place. In this circumstance, if one learned it wrong during the first year and kept doing it wrong for an additional 19 years, is that the kind of valuable experience a hiring manager is looking for during recruitment. I don’t think so. Or what about if one learned it well and correctly the first year but got stuck on doing it “that way” so long that he/she never added any new learning or thinking or different perspectives at all for the next 19 years. Is that what leaders want on their teams? I don’t think so. 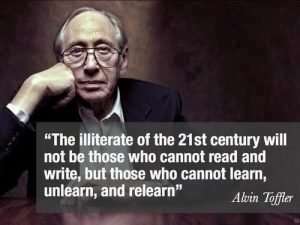 This is why it is so important to be able to demonstrate that you can “unlearn” when necessary and open up to new ways of doing things. The shame is not in not knowing something. The shame – and weakness – is in hiding the fact that you don’t know and then asserting your ignorance as if to highlight another person’s shortcomings. Strong, confident people ask questions, want to elicit new and different ideas, and have no problem admitting they don’t know something. It takes courage to admit you don’t know something or that you made a mistake. Weak-kneed executives and employees don’t travel this road. One of my graduate school professors told me that “managers make great statements, but leaders ask great questions.” That statement has stuck with me for years, and I am diligent about applying this theory to my own life. You cannot develop yourself or anyone else if you don’t ask questions. We should ask questions to continue our own learning and development and to challenge those around us to think and contribute on a larger scale. We should also ask questions to understand the deeper “Why” of things. This demonstrates that you are intellectually curious. We say we want to hire and promote critical thinkers who will analyze and interpret data and complex information. To do this, I encourage leaders to ask questions and get input from their teams whenever possible. Critical thinking is a skill, and leaders help to develop this and other key skills by asking questions first and challenging others to think. 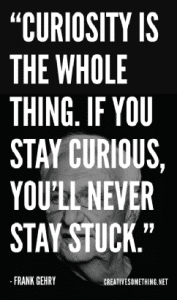 Are you intellectually curious? If so, how do you demonstrate it and if not, why? What have you failed at lately? The answer to this question provides information on whether or not the individual is likely to resist trying new things, and it provides insight into how comfortable he/she may or may not be with sometimes failing or making mistakes. Whenever you want innovative people who are willing to color outside the lines, you need a person who is open to take risks. How do you define integrity and share a time when you concluded someone you worked with was not showing integrity. Now, what did you do about it? What was your response to another person’s lack of integrity? The responses are critical in the hiring decision. 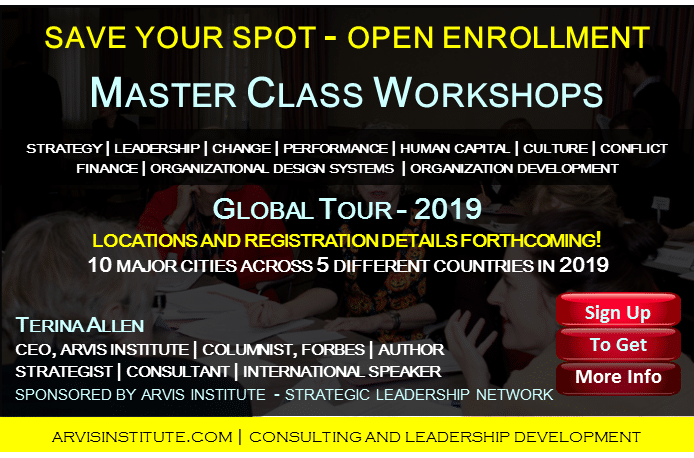 We know that high-performers and effective leaders are those who are willing to change course and thinking; they will remain open to continual learning and actually be proactive in ensuring they accomplish this. They also are willing to take calculated risks and try new things, new approaches and new methods even at the risk of failing or making a mistake. So remember, get all the educational credentials you need, network with high-profile and high-power professionals in your industry, and learn everything you can about leadership and career management – but be absolutely certain you add these four ingredients for career success and never stop stirring! Image Credit: Original source unknown for both photos.